Definition at line 44 of file asf-strategy.hpp. Definition at line 40 of file asf-strategy.cpp. 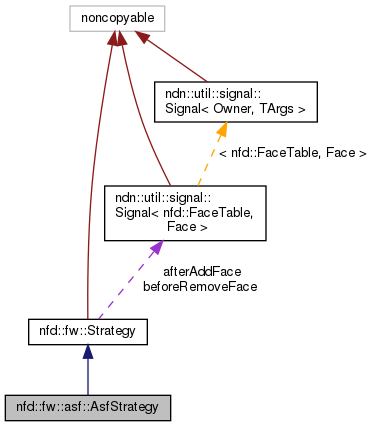 References nfd::fw::asf::ProbingModule::getProbingInterval(), getStrategyName(), nfd::fw::Strategy::makeInstanceName(), NFD_LOG_DEBUG, nfd::fw::Strategy::ParsedInstanceName::parameters, nfd::fw::Strategy::parseInstanceName(), nfd::fw::Strategy::setInstanceName(), ndn::to_string(), and nfd::fw::Strategy::ParsedInstanceName::version. Definition at line 65 of file asf-strategy.cpp. 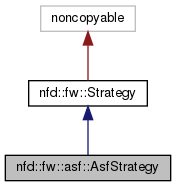 Definition at line 110 of file asf-strategy.cpp. References nfd::fw::asf::ProbingModule::afterForwardingProbe(), nfd::fw::RetxSuppressionExponential::decidePerPitEntry(), nfd::fw::FORWARD, nfd::fw::asf::ProbingModule::getFaceToProbe(), nfd::face::Face::getId(), nfd::fib::Entry::getNextHops(), nfd::fw::asf::ProbingModule::isProbingNeeded(), nfd::fw::Strategy::lookupFib(), nfd::fw::NEW, NFD_LOG_DEBUG, NFD_LOG_TRACE, nfd::fw::Strategy::rejectPendingInterest(), and nfd::fw::SUPPRESS. Definition at line 159 of file asf-strategy.cpp. References nfd::fw::asf::FaceInfo::cancelTimeoutEvent(), nfd::fw::asf::NamespaceInfo::extendFaceInfoLifetime(), nfd::fw::asf::NamespaceInfo::get(), nfd::face::Face::getId(), ndn::Data::getName(), nfd::fw::asf::AsfMeasurements::getNamespaceInfo(), nfd::fw::asf::FaceInfo::isTimeoutScheduled(), NFD_LOG_TRACE, and nfd::fw::asf::FaceInfo::recordRtt(). Definition at line 185 of file asf-strategy.cpp. References nfd::face::Face::getId(), ndn::lp::Nack::getInterest(), ndn::lp::Nack::getReason(), and NFD_LOG_DEBUG.